CFW Playstation 3 terbaru, mengikuti update firmware ps3 terbaru, kini playstation 3 developer telah merilis CFW 4.80 terbaru. 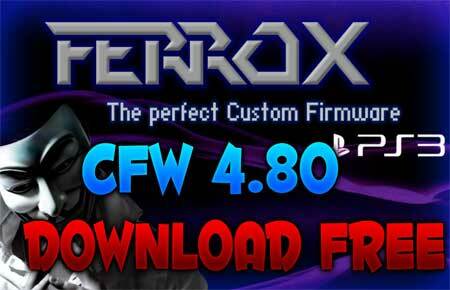 Nah bagi teman-teman yang masih menggunakan CFW di bawahnya bisa langsung update ke versi 4.80 Ferrox ini, untuk cara updatenya seperti biasa, ekstrak dan copy ke flashdisk dalam direktori PS3>UPDATE>. NEW FEATURE – New look of the XMB (See below). NEW FEATURE – Introduced ‘CyberModding HomebrewStore’ the web column. FEATURE – Compatibility PS2 games. FEATURE – Compatibility with the ‘latest version of ReactPSN. FEATURE – RSOD Bypass Screen Console sufferers RSOD. FEATURE – 4.80 Key to start games signed with 4.80 keys. FEATURE – XMB Support In-Game Screenshots. FEATURE – Support Remote Play. FEATURE – Integrated Package Manager, replaces the classic Install Package Files. PATCH – LV1: Patched to remove the LV2 protection. PATCH – LV1: Patched the CoreOS Hash Check to prevent Brick Console Downgradate non-Dehashed. PATCH – Disabled Epilepsy Message to Boot. PATCH – Disabled Cinavia protection.